A ‘BEATING the Bounds’ procession and picnic took place on Lyde Green Common over the first May Bank Holiday weekend. Organised by the Lyde Green Open Space group, on Sunday May 6 a group of 16 adults and children walked around the complete boundary of the Howsmoor Lane Common as part of Rogationtide. This is a traditional event that involves beating the boundaries of common land with willow sticks, as well as the making of prayers and blessings. During the event, the procession was led by the Rev Teresa Taylor from St James Church in Mangotsfield. 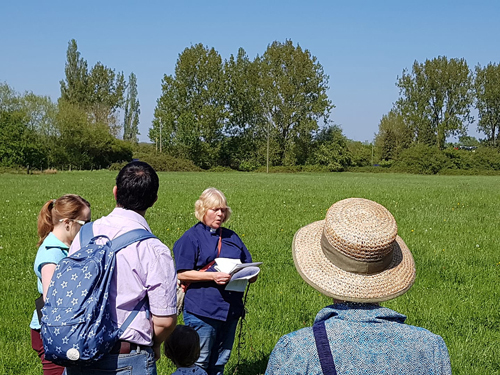 Although the common land actually falls into the ecclesiastical parish of Pucklechurch, the vicar of Pucklechurch was unable to attend so granted Teresa permission to lead the walk instead. Also in attendance was Lyde Green resident and Emersons Green Town Councillor Sadik Al-Hassan and his family, nature expert Rachel Tomlinson who put together a nature trail for children, and some representatives from South Gloucestershire Council’s TravelWest team who were promoting walking for health. Although the sun was shining and the event was well attended, there were some issues with motor bikers on one of the Common’s fields. Motor vehicles are not permitted on the Common land and the council installed some signs to promote this; however these have since been removed and the bikers have caused a lot of the land to be churned up and endangered walkers and dogs. The Lyde Green Open Space group are urging residents to call 101 with as much information as possible every time bikers are seen or heard on the common. They would also like to remind dog walkers of the need to pick up dog mess, and inform users that they are no longer able to bale hay from the common (one of their rights) due to the toxic waste and harmful bacteria that is present as a result of contaminated flood water flowing on to the space from developer land nearby.